Ukrainska Dumka (Ukrainian Thought) [«Українська Думка»] – a newspaper published in London from 1945 to 2017 by the Association of Ukrainians in Great Britain (AUGB). The newspaper was launched by the interim executive of the organisation which was originally known as the Association of Ukrainian Soldiers in the Polish Armed Forces and, in January 1946, was established as the AUGB. At first it was a bulletin intended only for members of the AUGB and appeared at irregular intervals under the name Nash Klych (Our Call, 19 issues from 18 November 1945 to 19 January 1947). It was subsequently renamed Ukrainska Dumka (Ukrainian Thought) to emphasise its Ukrainian character. On 9 February 1947 it began to appear fortnightly under the new name. On 15 September 1947 it became a weekly publication, and from this date it was published as a general newspaper aimed at all Ukrainians in the UK. Also from this date, for a few months it was produced by the Ukrainian Booksellers and Publishers, a joint enterprise of the AUGB and the Central Ukrainian Relief Bureau (CURB). 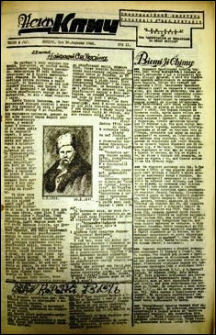 After the AUGB took over CURB’s activities in support of the newly-arrived Ukrainians in Great Britain, the newspaper reverted to being published solely by the AUGB. It continued to be published weekly until the end of September 2004, when it began to appear fortnightly. Owing to a decline in the number of subscribers, in 2017 it was decided to cease publication, and the final edition of the newspaper came out on 1 July of that year. Throughout its history the newspaper’s content has focused mainly on topics such as: the situation and events in Ukraine, events in British and world politics of relevance to Ukraine, the activities of the AUGB and its local branches, the life of Ukrainians around the world, and general information about Ukraine and its history. Until the 1980s considerable space was devoted to the dissident movement in the Ukrainian SSR and the worldwide movement in support of Ukrainian independence. In the twentieth century the newspaper often featured works of literature, written mainly by Ukrainian authors in the UK or other countries of the Ukrainian diaspora. The Ukrainska Dumka was essentially a Ukrainian-language newspaper, though it also contained material in English, especially in the final years, when English-language content was published more regularly. Until 2005 the newspaper included a number of pages edited on a regular basis (usually monthly, with some interruptions) by other organisations: Holos Molodi (edited by the Ukrainian Youth Association in Great Britain, from 1954), Plastova Storinka / Plastovyi Kutok (Plast Ukrainian Scouting Organisation in Great Britain, from 1954), Zhinocha Storinka (Association of Ukrainian Women in Great Britain, from 1956), Literaturna Storinka (Society of Ukrainian Litterateurs in Great Britain, initially published from 1964, taken over by the Society in 1974), Lohos (Association of Ukrainian Teachers in Great Britain, from 1973; also Uchytelske Slovo in 1963), Za Yednist Tserkvy i Narodu (Ukrainian Catholic Patriarchate Lay Association in Great Britain, from 1975). After 2005 occasional articles on the activities of these organisations appeared in the newspaper. The newspaper’s circulation (through subscriptions, distribution through AUGB branches, complimentary copies, in exchange for other publications, etc) rose to nearly 5,000 copies in 1948. It was approximately 2,100 in 1990 and 1,500 in 2000, and in subsequent years gradually declined. The newspaper was read in various countries around the world, though the majority of readers were in the UK. The following individuals served as editors of the newspaper: Peter Pihichyn (November 1945 – October 1946), Myroslav Semchyshyn (August 1947 – March 1949), Michael Dobriansky (April – November 1949), Teodor Danyliw (November 1949 – June 1950, May 1952 – November 1953), Mykyta Myronenko (July 1950 – May 1952), Olexa Woropay (October 1953 – August 1954), Ivan Krushelnycky (August 1954 – October 1960), Roman Borkowsky (November 1960 – March 1977), Swiatomyr Fostun (July 1977 – July 2004), Ludmila Pekarska (July 2004 – December 2006), Volodymyr Oleyko (May – July 2007), Oleksa Semenchenko (August 2007 – July 2011), Ludmila Pekarska (July 2011 – July 2017). Images: Ukrainska Dumka, 15 June 2013; Nash Klych, 30 March 1946.